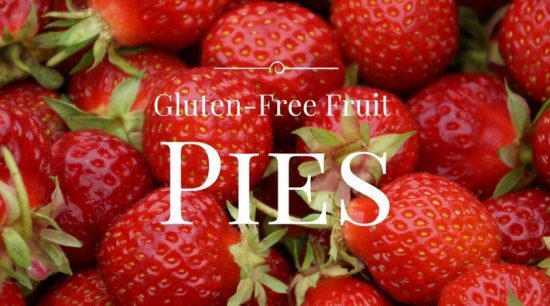 This is the only resource you will need for perfect gluten-free pies! I am talking about 50+ of my favorite websites for everything you will EVER need to make any kind of gluten-free pie with a flaky, buttery, mouth-watering crust! There are sweet pies, savory pies, and even fun creative ways to use pie crust covered. Unconventional crusts like. You will find recipes for not only gluten-free pie crust, but sweet pies, savory pies, and even fun creative ways to use pie crust. Unconventional crusts like a macaroon crust and hash brown crust too! 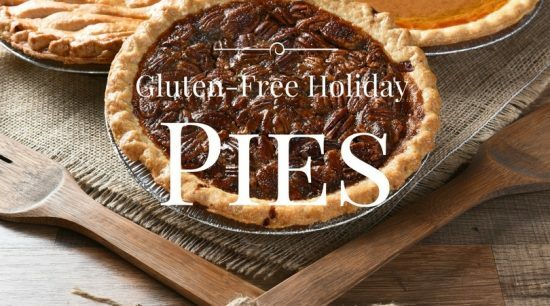 I am all for gluten-free pies! I love every kind of pie recipe you can imagine. Okay, maybe not mincemeat pie…but give me fruit, pumpkin, tarts, galettes, and I am one happy lady. It is my hope that some of these pie articles will give you the confidence to get creative and try your hand at making your own gluten-free pie crust from scratch! Now you can skip buying ready-made pie crusts in the store! 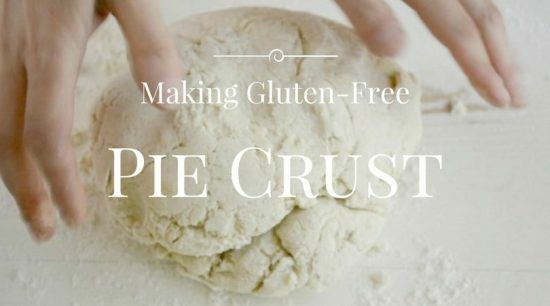 What are your biggest challenges when you make gluten-free pie crust? 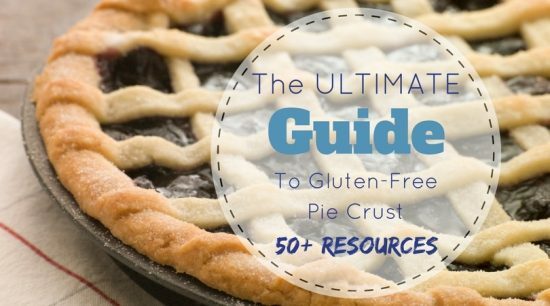 I have compiled 50+ resources to take you from the best gluten-free pie crust to pie fillings, so don’t forget to bookmark this so you can refer back to it again anytime you need. Sweet pies, savory pies…even tart and galette recipes! This is everything you need to know about how to make the perfect gluten-free pie in one easy place! Pie wouldn’t be a pie without the crust. This is THE most important part of your pie recipe. You could make a gluten-free pie without the crust, but why would you want to? A gluten-free pie crust can be made out of several different flours from your standard gluten-free flour blend to almond flour and coconut flour. Here are lots of ideas for you to experiment with to see what works best for you. These crusts all use a combination of gluten-free flours to mimic wheat flour. When you bake with gluten-free flours, you have to combine a few different flours and a starch to get them to bind together. This gluten-free flour blend works in all of these recipes, and the authors also have some great gluten-free flour blend combinations as well! How to Make a Gluten-Free Pie Crust by the Kitchn. Gluten-Free Flaky Pie Crust by Allergy Free Alaska. Gluten-Free Pie Crust by I’m Gluten Free. Coconut flour is perfect to make a gluten-free or paleo pie crust. One thing to watch for is coconut flour absorbs a LOT of moisture so you will notice that the wet ingredient quantities are a lot larger in these coconut flour pie crust recipes. My favorite coconut flours are by Anthony’s Organic Coconut Flour and Nutiva Organic Coconut Flour. Coconut Flour Pie Crust by Coconut Mama. Coconut Flour Pie Crust by Low Carb Yum. Almond flour is a fun ingredient that a lot of people on a paleo diet embrace. I love this because the almond flour in the pie crust adds a protein boost that helps balance out the sugar in the pie. I use primarily Anthony’s Premium Blanched Almond Flour and Honeyville Blanched Almond Flour. Paleo Pie Crust by Elana’s Pantry. Basic Almond Flour Pie Crust by Low Carb Maven. These are some other fun gluten-free crust ideas. Let me know if you try any! Three Ingredient Gluten-Free Pie Crust by Cotter Crunch. So creative! Gluten Free Raw No-Bake Tart Crust by Fearless Dining. This isn’t a baked flaky pie crust, but it is nutritious and absolutely delicious. The Easiest Chocolate Pie by Dessert For Two has a crust made out of shredded coconut! Fruit pies are loaded with juicy sweet fruits. That is what I love most about a fruit pie recipe, you can fill it with any type of fruit. The fruit can be fresh, frozen, or even from a can. The pie crust dough bakes in with the fruity flavors and makes pies delicious. Deep Dish Gluten Free Apple Pie by Raia’s Recipes. Classic Blueberry Pie by Migraine Relief Recipes. Old Fashioned Gluten-Free Apple Pie by The Spruce. Healthy Orange Pie with Almond Crust from Food, Faith, Fitness. Gluten Free Blackberry Pie by Gluten-Free Baking by Rachel. Gluten Free Dark Cherry Lemon Pie by Flippin Delicious. The holidays will be here before you know it and what is the first dessert you think of for Thanksgiving? Pie!! Lots of homemade gluten-free pie, gluten-free pumpkin pie, gluten-free apple pie, gluten-free pecan pie. Am I missing any? Here are some of my favorite homemade gluten-free pie recipes, many are even refined sugar-free! I even sneaked in a crustless pumpkin pie recipe, just in case you are trying to cut down on those carbs! If you are looking for a great pie baking dish to make your pies in, this ceramic pie dish or these easy metal baking tins are perfect. Gluten-Free Easter Pie by Confessions of an Over-Worked Mom. Gluten-Free Sweet Potato Pie by Fearless Dining. Mini Pumpkin Pie Tarts by Tasty Yummies. Gluten-Free Vegan Classic Pumpkin Pie from Sarah Bakes Gluten Free. Gluten-Free Pecan Bourbon Chocolate Pie by Carole Fenster Cooks. Raw Pecan Pie by Put Your Heart In It. Pumpkin Apple Pie by A Girl Worth Saving. Gluten-Free Vegan Pumpkin Pie with a Teff Pecan Crust by Healthy Slow Cooking. The Healthiest Crustless Pumpkin Pie by Strength and Sunshine. Who loves cream pies? 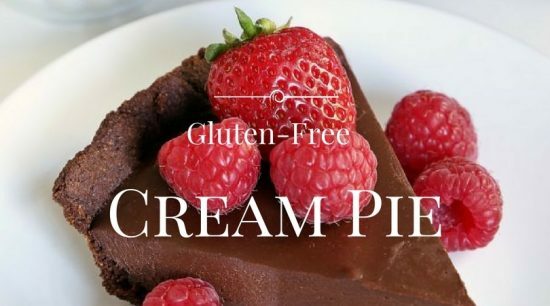 These gluten-free cream pie recipes are not only pretty to look at, but they are easy to make too! These pies are perfect all year round, but if it is a hot summer day, you will love the no-bake cream pie option below! You can make one of these cream pie recipes in any pie dish, or one of these disposable pie tins. Gluten-Free Ice Cream Pie with Cookie Dough Crust by Fearless Dining. No-Bake Vegan Banana Cream Pie by The Roasted Root. Gluten-Free Coconut Banana Cream Pie by GF Jules. No-Bake Mini Key Lime Pies by Spoonful of Flavor. Paleo Chocolate Cream Pie by Healthy Eats Real. 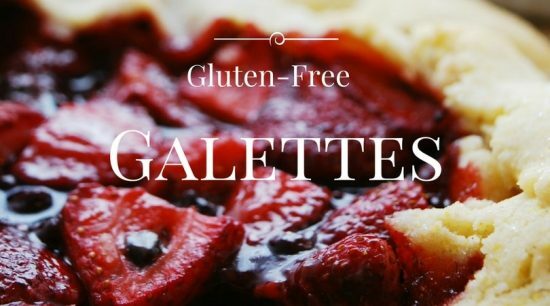 If you don’t feel like making two pie crusts, a gluten-free galette is a great way to get the pie flavors. Galettes are really easy to make on a cookie sheet! Put your rolled out pie crust dough on a cookie sheet, top with fruit, or your favorite pie filling, and fold up the edges of the pie crust around the filling. (Just make sure your cookie sheet has sides so the juices don’t leak out into your oven during the baking process. It is hard to clean the baked on juices off the bottom of your oven!) Bake and enjoy! Gluten-Free Strawberry Chocolate Galette by Allergy Awesomeness. Apple Galette by Gluten Free Miami. Gluten-Free Black Grape Mason Jar Lid Galettes by Fearless Dining. Glute-Free Plum and Hazelnut Galette by Blahnik Baker. Absolutely gorgeous! Gluten-Free Apricot Mascarpone Galette by Bonjon Gourmet. Rustic Cardamom Apple Galette with Maple Marscapone by Joyful Healthy Eats. 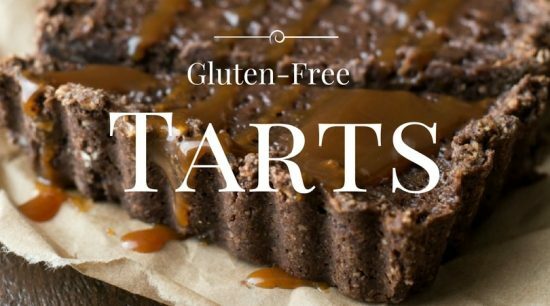 Gluten-free tarts can come in all shapes and sizes. You can make a really long tart with a rectangular tart pan and slice it into pieces, or you can make a big round tart. I love these mini tart pans! TIP: The big thing to look for when you buy a tart pan is to make sure the bottom pokes out. This makes it so easy to get the tart out of the baking pan! Key Lime Pie Tarts by Lexi’s Clean Kitchen. These would be great for a party! Mini Gluten-Free Lemon Tarts by Healthy Nibbles and Bits. Gluten-Free Fig and Walnut Tart at SnapGuide. Another stunning tart. I feel like I wouldn’t be doing pie full justice if we didn’t take a moment to talk about savory pies. These easy gluten-free pies come in all types from tarts to quiche to even cottage pie. Most of these pies make a savory delicious brunch or breakfast, or if you are crazy like we are, breakfast for dinner! Pie crusts can be fun when you are making a savory version. Think hash browns, potatoes, or even go crustless. 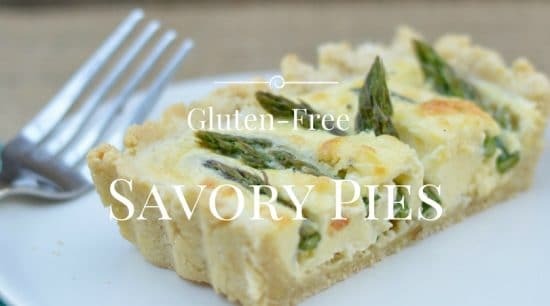 Gluten-Free Savory Goat Cheese and Asparagus Tart by Fearless Dining. Arugula Cremini Quiche by Cookie & Kate. Spinach and Pepper Quiche with Hash Brown Crust by The Mess Is Ours. Gluten-Free Quiche with Potato Crust by Almost Super Mom. Classic Cottage Pie by Grandma’s Gluten Free Recipes. Gluten-Free Goat Cheese and Tomato Tart by Primal Palate. Gluten-Free Mashed Potato Pie by Fearless Dining. These easy gluten-free pie recipes are a little more out of the box, and they all sound delicious. Do you have some fun ways to use pie crust in a recipe? Send it my way and I will see if it can be included. Strawberry Hand Pies by A Saucy Kitchen. I love this hand-held pie idea. Gluten-Free Pie Crust Pinwheels by Savy Saving Couple. You will love this fun use for pie crust! Frozen Peanut Butter Cup Pie by Half Baked Harvest. A showstopper gorgeous pie. I hope you love this roundup of all things pie related. These pies are fun at any time of year! Am I missing a fun pie recipe? Let me know and maybe I will include it! Mmmm now I’m starting to crave for pie. These are so good looking that I can’t wait to try them all! The whole family would love them! I love pies so this one is a sure hit for me! I want to make them all. Too bad I found this after the holiday season. Well anyway, pies know no season. I am so glad you are getting some pie inspiration. Pie definitely knows no season :-). I wanna try that Gluten-Free Peppermint Ice Cream Pie. I think it will satisfy the taste of it I have in mind. Nice collection of recipes! Looking forward to trying some of these! Thank you so much John, I can’t wait to hear which you liked best :-). This is a very informative post! Super helpful! Thank you for sharing. I’m always so intimidated by making dough but this post may be what I need to take the leap. I want to try them all! hat a great resource for gluten free desserts! Bookmarked this for holiday baking! I like making pies from scratch, and one of my issues is to get that perfect flaky crust. Thanks for the roundups. Awesome Calleigh, I hope you have a great holiday. This is such a handy resource – thank you for collating all these recipes together for us – you sure have covered everything! I learned so much from this post. I never knew all that about gluten and how to best use it. Love all your tips! Thank you. I am sharing this with all my GF friends!! This is a fantastic resource! Definitely sharing with my gluten-free friends! Thank you so much Dee :-). Wow this is one amazing resource!! This is an amazing resource! Thank you so much for collecting all of these recipes into one place! What an amazing guide! This will surely come in handy with the holidays coming up when we have guests with all types of dietary needs. Thank you for taking the time to compile it for us! You are welcome Jen, glad to help :-). I’m definitely going to try this soon! Thank you Jess. Have a great day. Awesome roundup, Sandi! This really is the ultimate GF pie guide, and I’ll definitely be referring to it when I make pies in the future! Thanks for including my pie crust recipe as well. I love your pie crust recipe so very glad to share it with everyone :-). I’m with you on the mincemeat pie—GAH! Not many things in this world are better than a flaky, buttery pie crust, and having so many options for making them gluten free is a godsend! Fantastic guide! LOL, poor mincemeat can’t catch a break 🙂 Thank you so much for the note. Dear Sandi, Such a great post! Gluten free crusts can get tricky so this is a perfect post. Thank you for sharing! What a fantastic and comprehensive post for those that are gluten-free. Pinning this! Thank you so much Jill. I appreciate the share :-). What a great post. It is tricky getting pie crusts right and gluten free would be even trickier. I’m pinning this so I can find it again. Great resourse. What a yummy round up!! I really have to work on my pastry skills so this is the perfect post for me! I would love to try each and every one of these, but I think I’d start with your sweet potato pie 😉 Looks so creamy! I want to try them all too. Thank you so much Dawn for the kind words. Thanks for this amazing guide! I’ll be sharing it with all my gluten-free friends. I can’t wait to make your apple pie for my family. It looks amazing!